Stand up for Kingdom Kids! Who we are and what do we believe? Our Mission: To equip, empower, and encourage children and their families by sharing the message of God's love and salvation through Christian Education. Our Vision: To be an advocate for young children. We believe in the power of God's Word! Our Goal: To use Gods message of love to reach young children and their families while incorporating literacy and early childhood education concepts that build Godly self-esteem, image and purpose; teaching young children who they were created to be according to the Word of God. 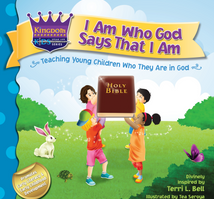 The foundation seeks to use the biblical principles from Kingdom Kids Books, along with its focus on Early Childhood Education and Early Literacy, to teach and train children how to live a Christian life as Kingdom Citizens. We believe that parents and educators play a vital role in the rearing of young children. The Foundation will provide Kingdom Kids programs such as Book Tours that will offer workshops, parenting classes, summer camps and professional development training for educators. The King will reply, 'Truly I tell you, whatever you did for one of the least of these my children, you did for me. $20 is all it takes to bless a child!